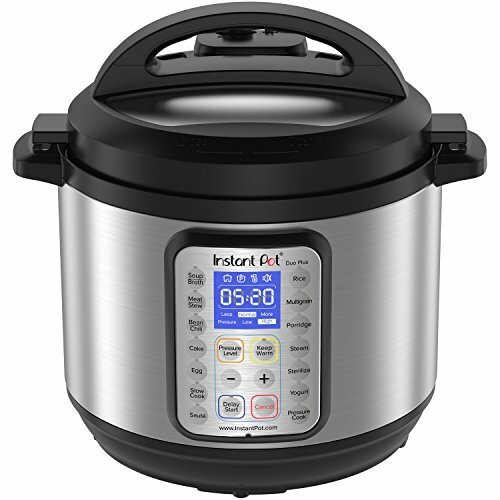 Instant Pot Duo Plus is the next evolution in the Duo Series, the #1 best-selling cooker in the Instant Pot family. The Duo Plus 9-in-1 Programmable kitchen appliance with advanced microprocessor technology incorporates all of the great features that made the Duo the #1 best-seller. It has new and improved programs and features to continually support one's fast-paced, health-conscious and eco-friendly lifestyle. The Duo Plus includes 3 new programs, Cake, Egg, and Sterilize. The Cake program has been designed to pressure cook soft and moist cakes; whereas, the Egg program has been created to prepare perfect eggs in just a few minutes. With the Sterilize program one can pasteurize milk, and sterilize baby bottles, jars, and utensils; as well as, perform certain types of canning much more conveniently than ever before! The Duo Plus is designed with a large blue LCD display with a new user interface to adjust the cooking settings, pressure levels, keep-warm on/off at any time during the cooking process. There are 4 new icons to easily view the status of the cooker, Heat, Pressure Cook, Keep Warm and Sound. The 'Heat' indicates heating or cooking in progress, 'Pressure Cook' indicates the pressure cook program is selected, 'Keep Warm' indicates if it is on/off, and 'Sound' indicates if the sound is on/off when cooking starts or is completed. The Duo Plus 9-in-1 kitchen appliance combines the functions of a pressure cooker, slow cooker, rice cooker, cake maker, yogurt maker, saute/searing pan, steamer, warmer, and sterilizer, while preserving nutrients and preparing healthy, tasty meals. All components in contact with food are food grade 304 (18/8) stainless steel including the lid, the inner pot with 3-ply bottom and steam rack with handles.